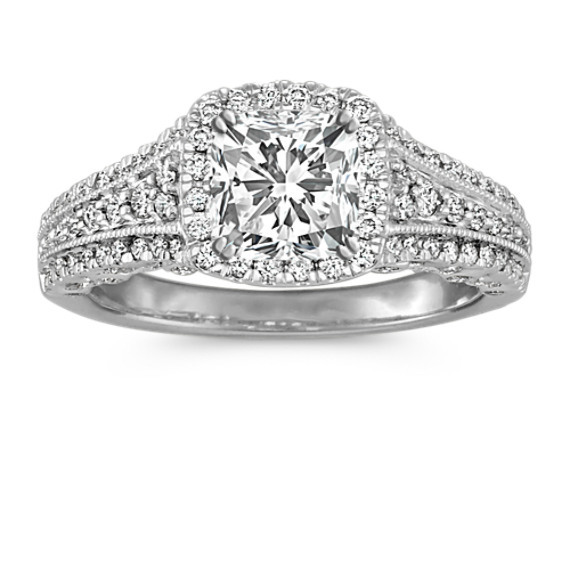 Pave-Set Round Diamond Halo Engagement Ring | Shane Co.
Brilliance radiates from every angle of this ring from a collection of 92 round diamonds, at approximately .53 carat total weight, pavé-set in quality 14 karat white gold. This engagement ring setting is a gorgeous background to your chosen 1.00 carat center diamond and will be held in a stunning halo design perfect for a round, princess cut or cushion cut diamond. The band of this setting measures 4.5mm and the outermost part of the halo measures 9mm. Gemstone Carat Weight :1/2 ct. t.w.